Why is Dumbbell Incline Press to effective? 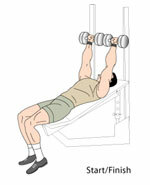 Incline Dumbbell Press Exercise is an excellent way to develop middle and upper pectoral Muscles. Check how to do them correctly and develop those awesome pecs you desire. Just like Incline Bench Press, Incline Dumbbell Press works mostly on upper pecs but dumbbells allows full range of motion and therefore in some ways better than bench press. To develop Muscle mass in upper and middle chest region. 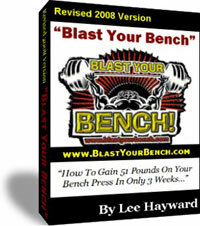 This exercise uses a bench set at about 45 degrees inclined. Do not go more upright as the stress shifts more to shoulders rather than chest area. 1. Grab a pair of dumbbells and lie on an incline bench. 3. 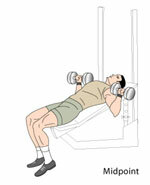 Lower the dumbbells in line with the shoulders, not above and feel a good chest muscle stretch at the bottom. Perform press in a controlled manner. If you have less shoulder flexibility do not try the above version when lowering Instead bring the elbows slightly forward and in front of the shoulders when you lower the dumbbells. Back to Weight Training Exercises Homepage.